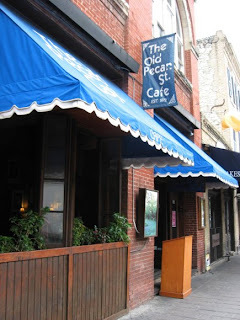 Since this weekend is the Pecan Street Festival, it only seems fitting to talk about my last dining experience at the Old Pecan Street Cafe. Despite having lived in Austin for 10 years (give or take a short break here and there) I only recently ventured to this restaurant for the first time. It was a Saturday morning and the evening before I bicycled down to meet some friends at Lavaca Street Pub. At the end of the evening, I was not in the right mental state to ride my bike home through downtown, so I had a friend drop me off at home. This meant that I had to return the next day to retrieve the bicycle. Boyfriend was in town and we were a bit hungry. I did some quick research for good Saturday brunches at restaurants that we had yet to try and came up with Capitol Brasserie. This was odd as I certainly did not remember this place existing, but I shrugged my shoulders and we ventured there anyway. The good news: my bike was still there, thanks bike lock! The bad news: Capitol Brasserie was not. Despite all it's online accolades, the place had shut down and been replaced by Imperia. I scrambled into the depths of my mind to remember other places in the area for brunch. To my understanding Sagra and Moonshine were only open for brunch on Sundays. I wasn't in the mood for Taverna and their bottomless mimosas. Driskill - not feeling it. What about the rest of dirty Sixth? Does Parkside do brunch? Then I thought - ah yes, we've never been to Old Pecan Street Cafe. Walking up to the restaurant we spotted pleasant looking entrees gracing the outdoor tables lined up at the sidewalk. This was a good start. We entered into the place with lots of natural light and an old timey wooden feel. Antique framed maps and vintage photographs cover the walls and the tables are set with small simple flowers. The restaurant romantically takes you back to a time when Sixth Street was nothing like it is today. No vomiting college students or bride-to-be's in condom veils, just a shady lane with lots of pecan trees and a few restaurants and businesses. Unfortunately, we would find that the dishes hadn't been updated much since then either. 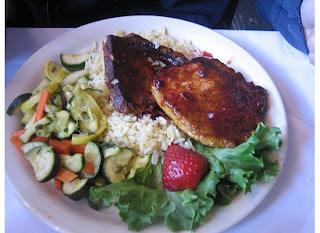 Boyfriend ordered a raspberry chipotle pork chop that was served with a salad, rice and mixed vegetables. He said the food was alright but that the raspberry sauce was just a bit too sweet for him and the vegetables were overcooked. It looks OK. I ordered the Crepes d' Epinard- egg crepes filled with fresh baby leaf spinach and blended imported cheese, served with a garden salad, broccoli and cantaloupe. Sounds delicious, right? Well... I'll just make you a diagram. I appreciate American food and it wasn't terrible per se, but it really could use some sprucing up. A menu revamp or new chef would not at all endanger the charm old-timey feel that the restaurant delivers. Bottom Line: A really cool and charming well preserved physical space that serves food like your grandmother used to cook if she cooked average quality food in the just barely post-depression era. Ugh, I feel like I've just punched someone's grandma by saying that.